Games on the iPad are nothing new, and there are many different titles for one to choose from. The thing is, which games are out of the ordinary, while there are dime a dozen of other titles that do nothing but generate a “meh” attitude? If you would like something that is out of the ordinary, perhaps you would be interested in checking out the £69.99 Osmo. 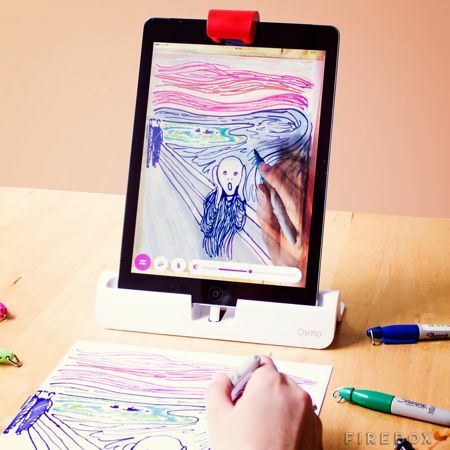 Osmo happens to be a groundbreaking iPad game which will change the way your kid plays, as it expands gameplay beyond the screen encouraging creative thinking. The trio of gameplay titles happen to be Words, Tangram and Newton, where each mode is wonderfully different and equally enticing. ‘Words’ will show off a picture on your iPad alongside a number of blanks in order to be completed by placing letters in front of your screen. It is a fight against time when it comes to solving puzzles. ‘Tangram’ happens to be a shape matching challenge, while ‘Newton’ is a game where you make use of pen and paper in order to connect falling beads to targets by drawing lines. There will be a trio of different games that are part of the mix, ranging from assembling puzzles with real life pieces to rearranging word tiles, and it also boasts of the added flexibility of being played and created by the whole family, anywhere, anytime – and best of all is, regardless of the surface. Using it is pretty simple – all that you need to do is to attach the included reflector and stand to your iPad and you’re good to go. Sorry James, my bad – I have amended it. That’s pretty pricey … would like to explore more about how it works before committing money towards it!